When visiting a new city for the first time, any foodie’s first question is, “Where do I eat?” I rely on cross-referencing friends’ recommendations with Trip Advisor and Yelp so I ensure I go to places locals would eat and not the easy, middle of the road places that happen to be popular. My first meal stop proved to a tough decision, but I ultimately chose Blue Water Cafe in the city’s Yaletown neighborhood. 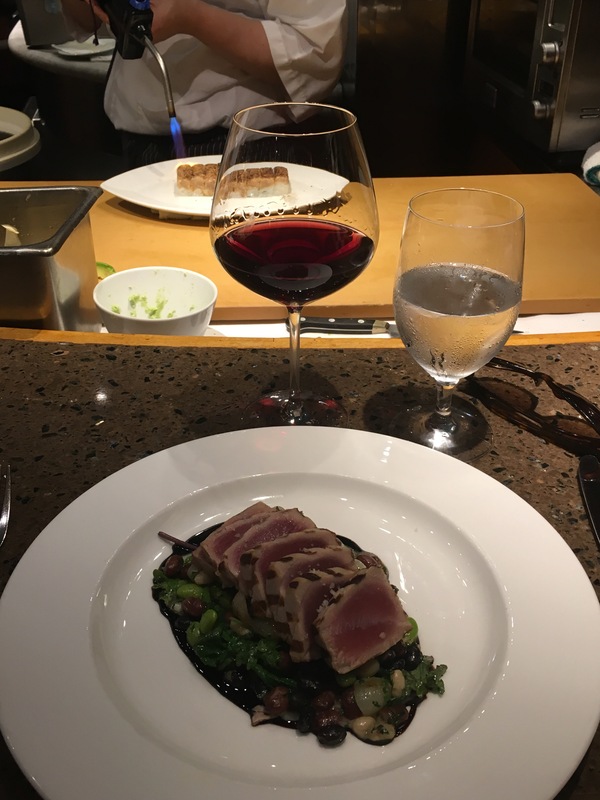 It was a great introduction to Vancouver’s Pacific Rim fusion cuisine and British Columbia’s burgeoning wine industry. Vancouver, like many cities along the Pacific Rim, has an immense seaport and is a great source of fresh seafood. Coupled with its heavy Asian cultural influence, it’s a destination for sushi lovers. Blue Water Cafe is one of Vancouver’s elegant sushi bars, and like famed sushi spot Miku, it features the unique Aburi style – the fish partly torch-seared or grilled rather than fully raw. Yet Blue Water Cafe is well known also for its raw bar with a seemingly endless selection of oysters, as well as its cooked dishes. Its menu is one designed to have something for everyone. As such, it was no surprise to see an array of business dinners, locals, and travelers alike. 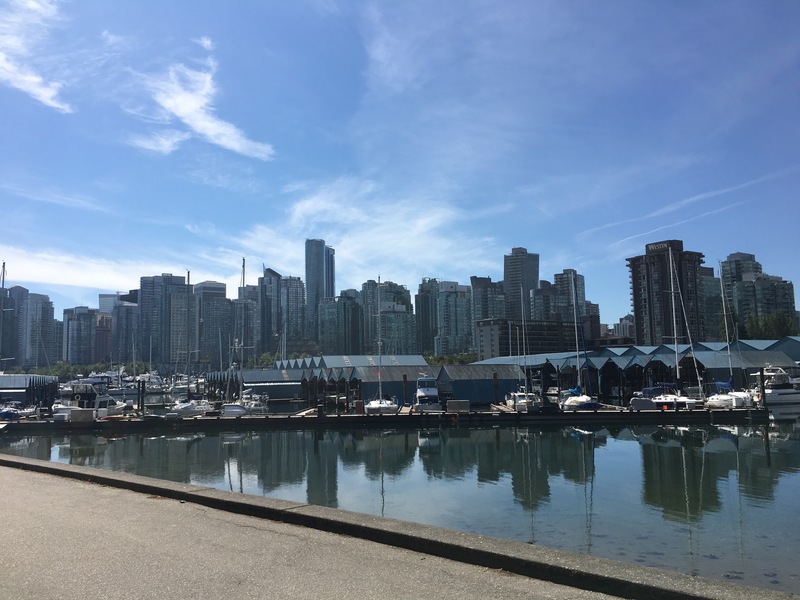 What appealed to me was the relative lack of tourists, since Yaletown is a bit off the beaten path from the downtown waterfront area housing the cruise ship terminal and most large hotels. Yet Yaletown is an easy and fairly safe 15-20 minute walk from those areas. I dined on a Tuesday night, and the restaurant was packed indoors and out. I recommend securing a reservation if you are able. 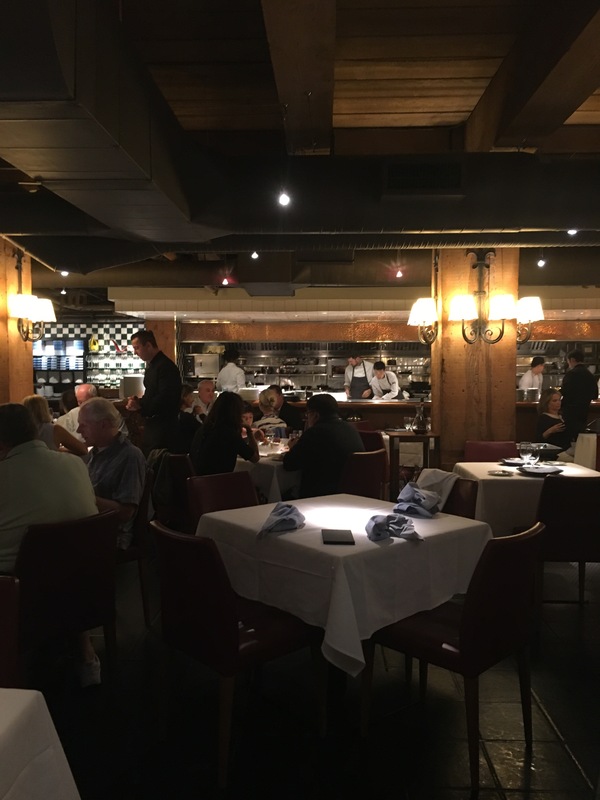 Flying solo, I preferred to wait for a seat to open up at the bar (I hate sitting at a table by myself and enjoy watching chefs and bartenders work, as well as the communal nature of bars. Yet even bar seating required a wait at 7:45 pm! I sat between U.K. and Australian accents during my wait, and the accommodating, friendly hostesses set us each up with a beverage from the extensive wine and spirits menu. I am a huge proponent of going local, so I ended my British Columbia wine virginity with a Spotted Owl Sauvignon Blanc from the Okanagan Valley. I later learned that this winery is well-known and well-established in that region. I was not terribly impressed, however. It was dry, with an almost Old World minerality but lacking the complexity of a flinty Sancerre or the crisp citrus notes of a New World Marlborough that compliment spicy food so well. I’d pass on that in the future – at least without food. 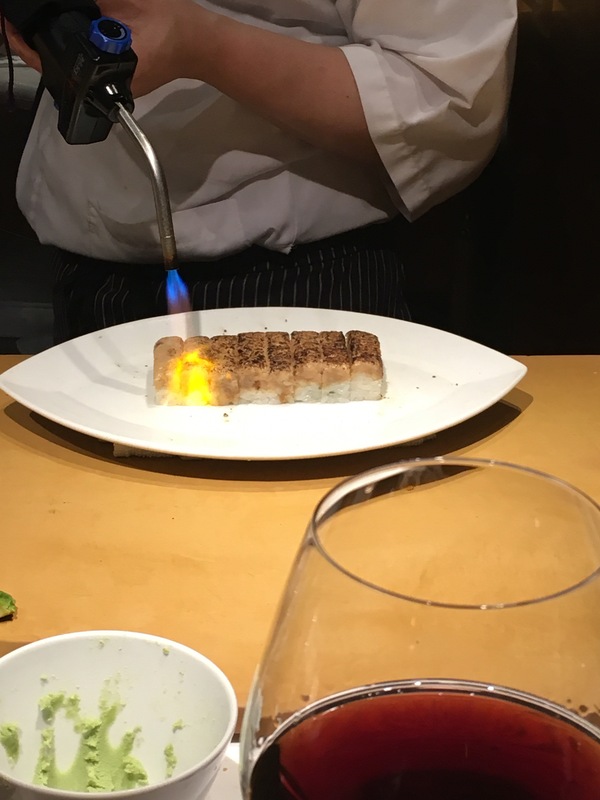 To my delight, a seat opened up at the sushi bar, giving me a view of culinary art in progressed. 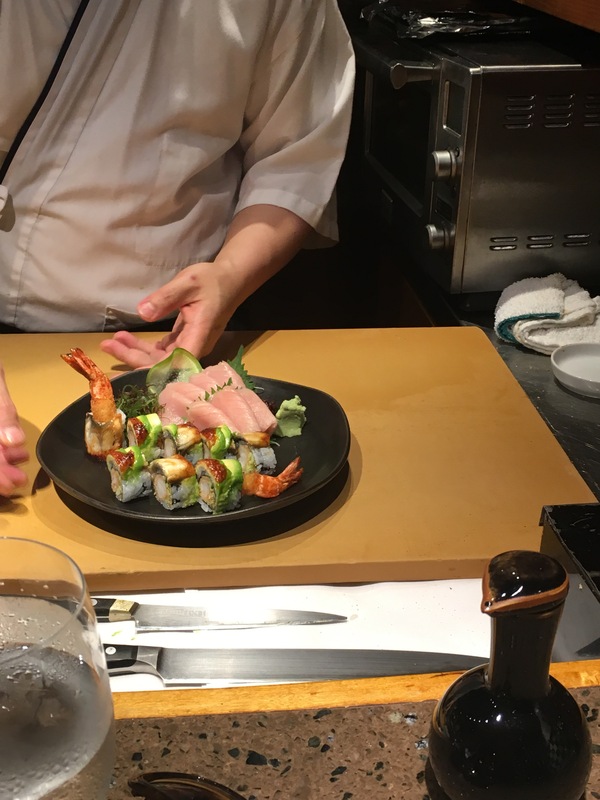 The sushi chef, one of four working the counter, appeared mildly amused as I watched and photographed his handiwork while waiting for my food. To start, I needed some healthy greens, and I opted for the server’s recommendation of the special summer salad and not the seasonal salad I originally craved. 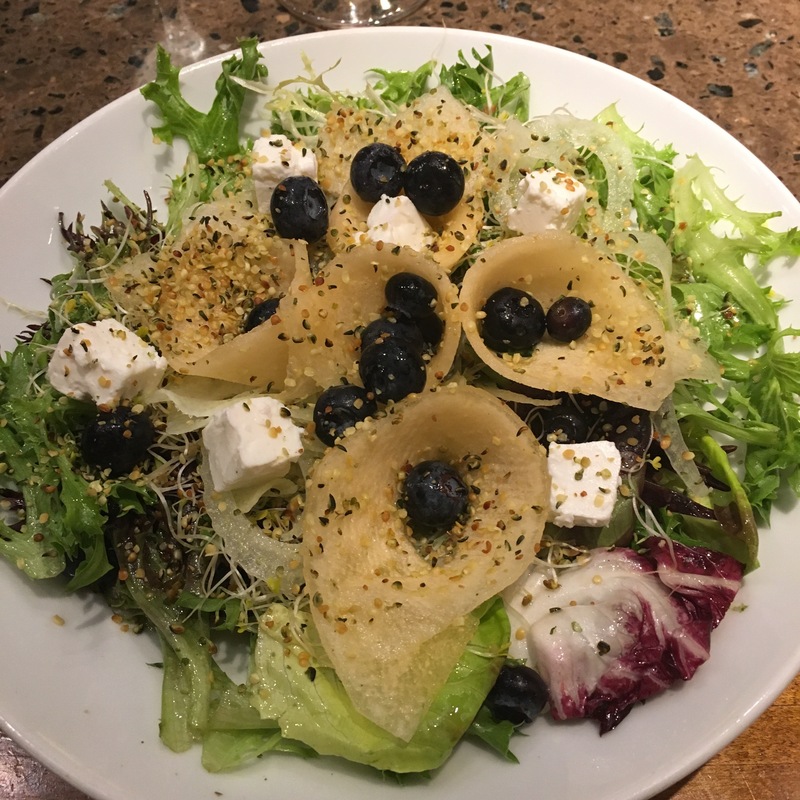 The special was comprised of mixed lettuces, celeriac, savory summer melon, blueberry, and cubes of barrel aged feta (the latter of which doesn’t have any perceptible difference from “regular” feta). I would have liked the melon to be a bit more ripe and sweet to provide more complexity and contrast of notes, but it was quite tasty with interesting textures. I paired the salad with a glass of Blue Mountain Brut, a sparkling rosé of Pinot noir from the Okanagan Valley. I found this wine to be pleasing, but again lacking a bit of complexity and balance, but not all that far off from a solid Cremant de Loire or Bourgogne. 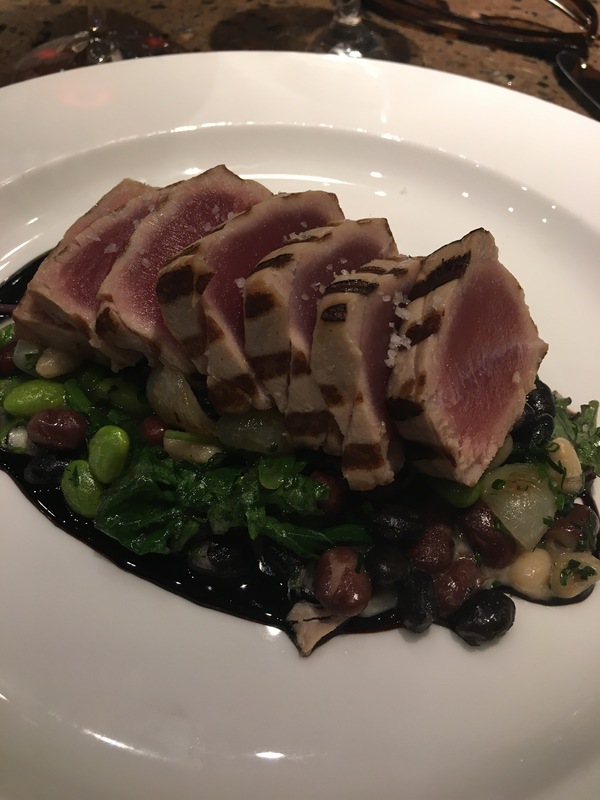 For my main course, I chose a yellowfin tuna seared rare with flecks of sea salt with baby Dino kale, a bean trio of edamame, white and black beans. It was served over a wonderfully Unami sweet onion purée and a tangy soy-balsamic reduction that somewhat resembled Worcestershire sauce with notes of tamarind. It was. A. Ma. Zing. It was the best seared tuna i’ve had since Waterbar. The accompaniments were harmonious and nicely balanced. Ready for a red, I chose an Okanagan, single vineyard Desperation Hill Pinot noir, from La Frenz in the Naramata Bench. I was pleasantly surprised at the complexity of this wine, as its 50 degree latitude is on the northern end of wine-growing regions – and red varietals are notably inconsistent at extreme latitudes. This delicate fruitiness paired well with the tuna and its accompaniments. It was a course to remember. In terms of other main courses, the Sablefish is the most popular and is great for summer poached in a light dashi-miso broth. The scallops with wild rice cakes smelled so amazing, I wanted some for myself. My sushi bar neighbors recommended both of these entrees. I willed myself to skip dessert, but the restaurant makes the check a bit sweeter with a tiny cake duo. 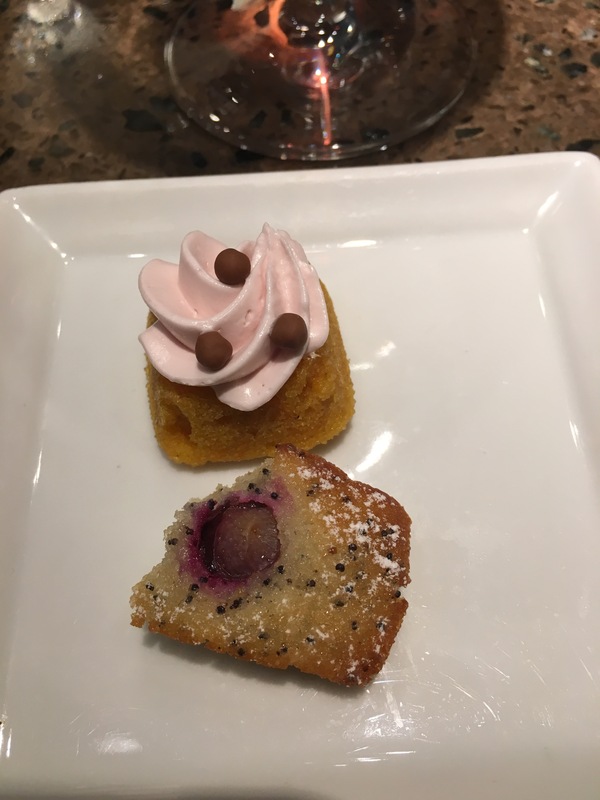 Tonight’s consisted of a poppyseed blueberry financier and “the world’s smallest carrot cake” with a dollop of berry buttercream. Both had lovely essences of orange and lemon zest. They were the perfect ending to a wonderful culinary welcome to Vancouver, BC.